I was woken-up early this morning with a request to get an aircraft up over the centre of Tottenham to photograph the smoking consequences of last nights riots. You could see the columns of smoke rising over the Lea valley from some considerable distance away, as I cut across the London zone near City Airport and the West Ham football ground. 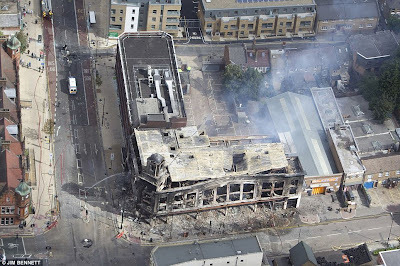 By the time I arrived, some of the fires were still burning fiercely and the area south of White Hart Lane resembled a war-zone. With the Sky News helicopter conveniently leaving to refuel, you'll see the photos appearing in a number of the tabloid newspapers and to be honest, having seen the results of last night's mayhem from a bird-eye perspective, it's all rather shocking, as the community will have to live with the consequences for a long time to come.